Eight Years Ago Today - . Today Mr. Rosenberg and I celebrate eight years of marriage. After we met, Jeff waited a full six months to bring up the topic of marriage. He did this by proposing. We waited another four months before eloping. I purchased a white cocktail dress and pale blue sandals on sale and picked up a veil at a Mexican wedding store. Jeff bought a new shirt and tie. As so many couples have done before us, we packed up the car and drove to Vegas. It was 113F degrees when we pulled into the parking lot of the Little Church of the West on the strip. In the office, brides and grooms were lined up and waiting. We paid $348.00 for the “Tie the Knot” package entitling us to an organist, a minister, a rose bouquet and boutonniere, a photo package, and live streaming video of the ceremony so that our friends and family could attend from the comfort of their homes. Our big day was to be 15 minutes all in. We waited our turn in the car to take advantage of the air conditioning. “I promise to still hold your hands when we are old.” Jeff took my hands in his and squeezed. “I promise to be happy to see you every time you walk in the door,” I said. “I read that the number one predictor of couples who break up is the eye roll. It implies a lack of respect or something.” Through the windshield, I watched the couple scheduled just ahead of us exit the chapel. The church bells rang. I re-applied lipstick in the rearview mirror and took one last look at myself as a single person. I had been married twice before and had not been in a hurry to run down the aisle again. This time it was different: a true match, and with this day a sweetness and a simplicity. Jeff and I had started planning a small wedding and then realized that there is no such thing as a small wedding. Our time, energy, and money were getting pulled into the undertow of wedding plans. My heart wasn’t in it. I wanted to start my life as Mrs. Rosenberg, I just couldn’t face my beloved crowd of friends and family over trays of catered appetizers one more time and ask them to believe that, no really, this time I meant it. I wanted to prove it by making it happen and that would take years, long happy years. We entered the chapel and met the organist who would double as our witness. She introduced us to our minister, an older black gentleman in a gray suit. With a southern accent, the minister briefed us on how the ceremony would unfold and showed us where the webcam was set up. Jeff handed him a small wineglass wrapped in a cloth napkin and asked if at the very end he could set the glass on the floor so that he could stomp on it. He would then say, “Mazel Tov,” explaining that these were the Yiddish words for “congratulations” or “good fortune.” The minister seemed confused by the request but was willing. Jeff paid him the ceremony fee and the minister signed a receipt. We took our places. The organist played the wedding march and nodded at me to begin my walk down the aisle. This was not unfamiliar and at the same time it was all new. I thought of Back-to-School Night in elementary school, walking into my classroom when it was dark outside seemed foreign and magical yet there was my desk right where I had left it. I knew this song and had walked these steps before but this time these steps led home. We heard the Corinthians verse. We did our I Do-ing. We waved at the web-cam. We were pronounced husband and wife. Jeff asked for the glass. He broke it with a heavy step and waited. The minister stared at us blankly. “Say Mazel Tov,” whispered Jeff. “Muzzle Tofe!” said the minister. Jeff lifted my veil, put one hand on either side of my face and kissed me. We posed for the wedding chapel version of prom photos complete with faux floral arrangements. We were congratulated by our organist/witness and ushered out. Jeff took our camera and I posed for him in front of the chapel. People driving past honked and waved. “That’s for you Mrs. Rosenberg!” Jeff called out. The church bells rang. I cried with all the happy. Now that is one hell of a terrific wedding story. I love it. And you two were/are beautiful. Oh, I love this story!! Truly love it. Congratulations and happy anniversary...and, um, "muffle toss!" I love this, Lisa. 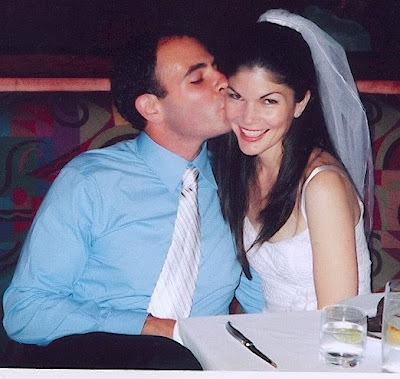 HAPPY Anniversary, Mr and Mrs Rosenberg! I remember scrolling to the beginning of your blog long ago, to read how it all began. Seems like just yesterday. Happy Anniversary. What a great story! Congrats to you both. AH! I love this story so much. Muzzle Tofe indeed!!! And now *I* am crying from all the happy. Mazels, you guys!! PS - we stepped on a glass too... it felt correct for non-Jewish-either-of-us, but it's just in my heart. PPS - you're totally right about the eye-roll, woman. Yes. Aw, I love this so much. Happy anniversary, Mrs. (and Mr.) Rosenberg! Mazel Tov & God bless you both. And now I'm crying with all the happy. What a wonderful piece to read first thing in the morning! Happy Anniversary! happy anniversary! that's a lovely story. i watched my little sister's wedding streaming live on sunday. it closed a distance of 5,000 miles. it was short, sweet and not all all traditional, except for the dress. when the groom responded with a firm 'damn straight i do,' i wept with joy. Happy Anniversary! Lots of happy tears for you! I loved your story. Happy Anniversary! I love your story and I one hundred percent get about wanting to do it the way you did. Because this time, it's the most wonderful way to start forever together. See? This is what happens when a woman manages to stay beautiful in spite of being *ahem* a few years past 30. Most of us aren't so fortunate. You are beautiful. I hope you stay that way always. Thanks for sharing your tale here. What a great story. Happy Anniversary! Beautiful. Like you and the Mr.